A former Free Imperial City, Dinkelsbühl is a pleasant and colourful historical town. Its charm lies in its intact city walls dotted with 16 towers and four gates. Fortified by Emperor Henry V in the early 12th century, Dinkelsbühl quickly rose into prominence, receiving the same municipal rights as ulm in 1305, and becoming a Free Imperial City in 1351. 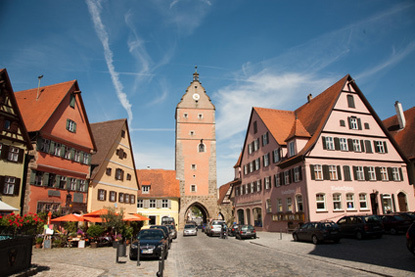 Following the Protestant Reformation, Dinkelsbühl had the distinction of being of of the few Imperial cities with a joint Catholic and Protestant government and administrative system. This unusual status lasted until the incorporation of the city into the Kingdom of Bavaria in 1802.